The blog post was written by Xavier Courouble for the Warren M. Robbins Library, National Museum of African Art, Smithsonian Institution, on the occasion of the 75th anniversary of Léopold Sédar Senghor’s release from World War II internment camps. In his second volume of poems, Hosties Noires, published in 1948, Léopold Sédar Senghor presented a series of poems based on his personal experience during the troubled and shameful period of the World War II occupation of France, most particularly his 19 months spent in internment camps for French colonial prisoners of war. The first-edition volume of poems was recently accessioned to the collection of the Smithsonian Libraries, and is held by the Warren M. Robbins Library at the National Museum of African Art. The five poems written in Amiens and Poitiers appear, as stated by Abiola Irele, less as a sharp, plaintive documentation of the condition of the black man than as a profound, poetic meditation upon human folly and failures, a disillusionment with European civilization, and the faith in the moral values Senghor associates with Africa. Janos Riesz argues that if one wants to learn more about Senghor’s true feelings during this time —about the depths of fear and despair into which the war plunged him— then one should not consult the narratives of his later life, which have quite a different aim than giving an accurate picture of the reality of war and prison life. Rather, one should study Senghor’s poems of that period, the “Hosties Noires, annales de la souffrance et du sacrifice,” as the poet Armand Guibert suggests. In 2010, while researching internment camps for French colonial soldiers during WW2, Raffael Scheck identified an anonymous report dated June 27, 1942 and written by a Senegalese prisoner. The 7-page report , handed to the POW Camps Inspector General, Dr. Bonnaud, was written by Léopold Sédar Senghor, at the time the only associate professor of African origin teaching in a lycée near Paris. Instead of providing a mere account of the realities of the camps, as listed in the report, Senghors’ poems set themselves a more radical task: they testify, in a literary form, to a necessity, an absolute engagement, to tell about a degrading truth, as well as to convey, conscientiously and intellectually, an imperative sense of hope. The camp had two periods of occupation: from 1940 to 1942, under German military rule, approximately 7,000 French colonial POWs were kept under harsh conditions; then, in February 1945, German civilians (men, women, and children) were regrouped in the same barracks by the French authorities. The camp had to be closed in November 1945 after an investigation revealed the inhuman living conditions imposed by the corrupted French administration, resulting in the death of 265 internees. For the following seventy years, the memory of the camp and its prisoners has gradually vanished and all traces of its existence erased. The decision to forget, as experienced in Poitiers, should be seen in the light of the shameful history of the Camp de la Chauvinerie, as well as the result of a strategy applied by the state to establish specific representations of the role of France in the war. De Gaulle was expedient to leave the story of the real resistance untold, for not to reveal the true level of collaboration, as he was obliged to include many high-level civil servants who had collaborated, in his own post-war administration. The transition period, when it may have been best not to unlock the past with all its ghosts, has come to an end. The memories of local camps of interment can be spoken about more openly. Nowadays, associations, communities, and municipalities throughout the country have embarked in multiple initiatives to bring forward a painful recollection of their past, to transform these internment camps from transient places to sites of mourning, memory, and ultimately of commemoration. Léopold Sédar Senghor’s poems may capture the delicate but necessary balance between community insider and outsider the way the black character in Géricault’s painting “The Raft of the Medusa,” does. For this community, in the face of such alienation, poetry may prove to be the most extraordinary form to revisit its past and to redefine its identity. What follows are excerpts from Senghor’s poems, in original French followed by English translations. To read the full poems in French, see Hosties noires, by Léopold Sédar Senghor (Collection Pierres Vives. Paris: Édition du Seuil, 1948). For English translations, explore The Collected Poetry, by Léopold Sédar Senghor (author) and Melvin Dixon (translator) (University of Virginia, Charlottesville: University Press of Virginia, 1991). 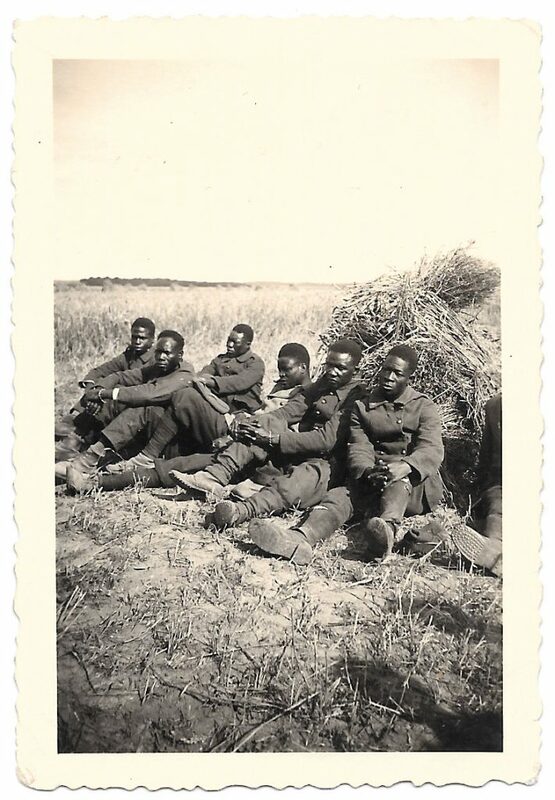 Here lines of Senghor’s poetry are accompanied by photographs of French Colonial Soldiers from World War II, courtesy of the blog post author’s (Xavier Courouble’s) collection. 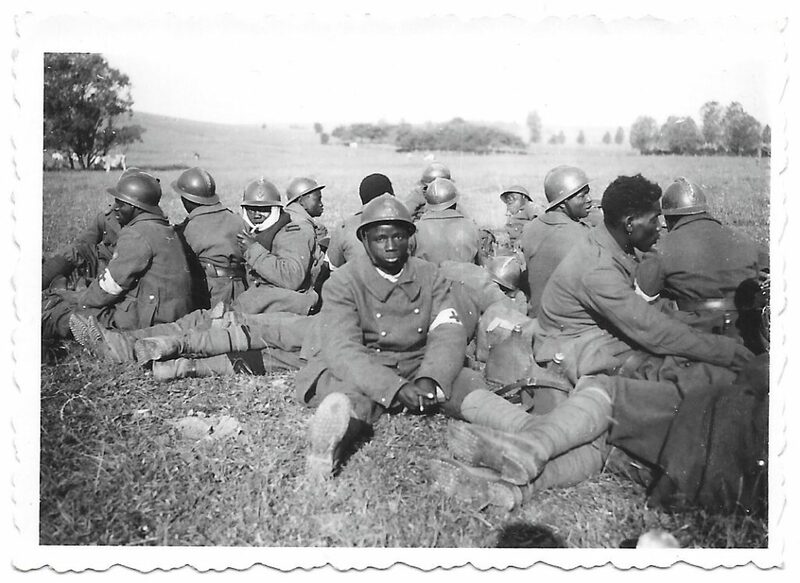 French Colonial Soldiers photographed after their Capture at La Charité-sur-Loire, France, 1940. Nous t’avons écouté, nous t’avons entendu avec les oreilles de notre cœur. Comme celle du Seigneur de la brousse, et quel frisson a parcouru l’onde de notre échine courbe ! With the ears of our heart. Raced up the spines of our bent backs! French Colonial Prisoners Photographed with their Civilian “Godmothers” at Hopital Complémentaire du Grand-Séminaire, Rennes, France, August 1941. Like a sword of lightning piercing its heart from East to West. 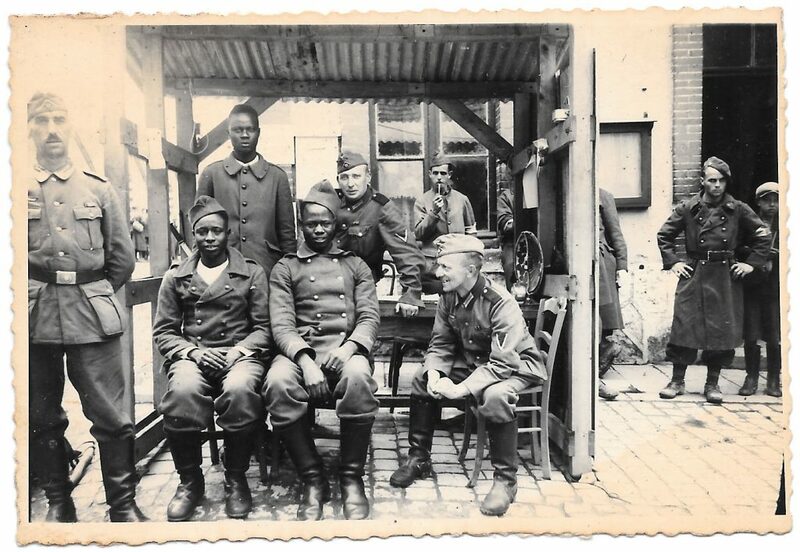 French Colonial Prisoners Photographed with their German Guards, France, 1940-1944. Senegalese prisoners lying gloomily on French soil. 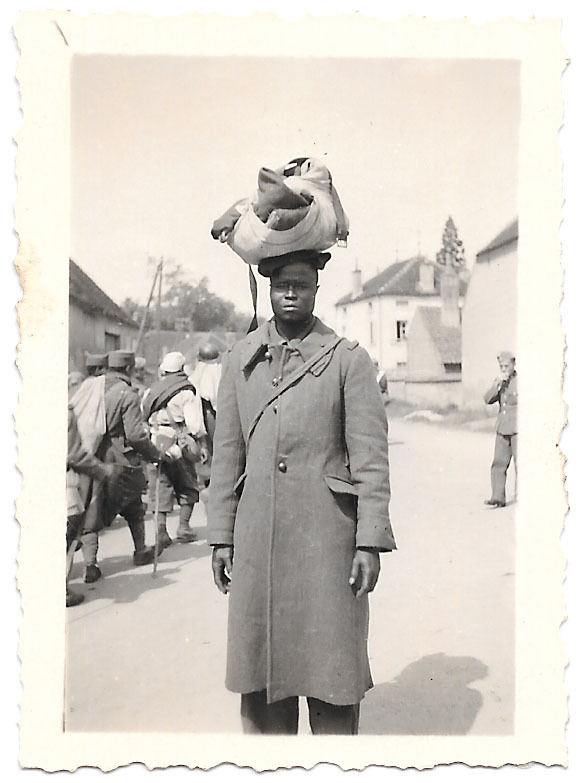 A French Colonial Prisoner Photographed during his Transfer to an Internment Camp, France, 1940-1944. Me réchauffais de ta ferveur aux soirs d’hiver autour du poêle rouge qui donnait froid. Mbaye Dyôb! I want to say your name and your honor. Around the red stewpot growing cold. 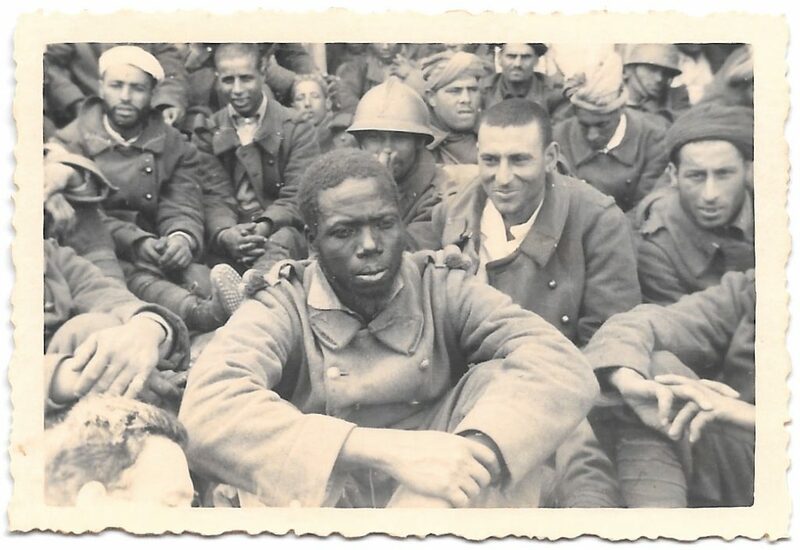 A Sub-Saharan African Prisoner Photographed among French Colonial Soldiers from North Africa, France, 1940-1944. French Colonial Prisoners Assigned to Small Work Commando, France, 1940-1944. Echenberg, Myron J. Colonial Conscripts : the Tirailleurs Sénégalais in French West Africa, 1857-1960. Portsmouth, N.H. : Heinemann ; London : J. Currey, 1991. Guibert, Armand. “Léopold Sédar Senghor,” Poètes d’aujourd’hui 82. Paris: Pierre Seghers, 1969. Irele, Abiola. “Léopold Sédar Senghor as Poet,” Odu. N.S. no. 1, April 1969, p. 3-27. Riesz, Janos and Bjornson, Aija. “Senghor and the Germans,” Research in African Literatures 33 (4), 2002, p. 25-37. Scheck, Raffael. 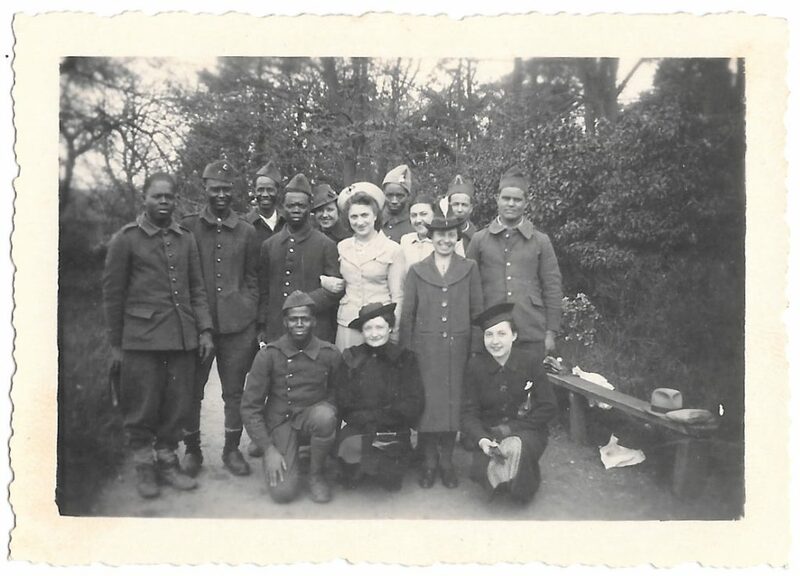 French Colonial Soldiers in German Captivity during World War II. Cambridge : Cambridge University Press, 2014. Senghor, Léopold Sédar. “Hosties Noires,” Collection Pierres Vives. Paris: Édition du Seuil, 1948. Senghor, Léopold Sédar. “The Collected Poetry,” translated and with an Introduction by Melvin Dixon. University of Virginia, Charlottesville: University Press of Virginia, 1991. Senghor, Léopold Sédar. “Selected Poems,” translated and Introduced by John Reed and Clive Wake. New York : Atheneum, 1964. Vaillant, Janet. Black, French, and African : a Life of Léopold Sédar Senghor. Cambridge, Mass. : Harvard University Press, 1990. All photographs are courtesy of the author. “It takes times for what has been erased to surface,” in The Search Warrant by Patrick Modiano, translated from the French by Joanna Kilmartin. London: Harvill, September 2000. After his capture on June 20th. 1940 at La Charité-sur-Loire, Senghor was transferred from camp to camp, successively in Amiens (Frontstalag 204), Romilly-sur-Seine, Troyes (Frontstalag 124), Poitiers (Frontstalag 230), and Saint Médard-en-Jalles (Frontstalag 221). In early spring 1942, he was finally released on health grounds. Senghor’s manuscripts, written during his internment at Frontstalag 230 (later called Camp de la Chauvinerie) were rescued by a German guard, Walter Pichl, who, while on leave, accepted to bring them to safety to Georges Pompidou in Paris. Note pour le cabinet, by Dr. Bonnaud, June 27, 1942, in AN, F9, 2345, with the appended report, as well as Compte-rendu de captivité établi par un prisonnier indigène récemment libéré, July 7, 1942, also in SHD, 2 P 70, Rapports de prisonniers de guerre rapatriés sur leur détention dans les camps 1941–1943, Dossier II: 1942–1943. The report was published in full in Jeune Afrique, 51, no. 2637, July 24, 2011, pp. 25–30. Les Montgorges is a new urban development that is today located between Poitiers’s historic town and the regional airport. Several new streets have been named following three distinctive themes: on the north-west, close to the airport, streets have been named after famous French aviators, surprisingly including the American woman aviator, Bessie Coleman! In the center, streets have been named after three famous writers of the Négritude movement: Léopold Sédar Senghor, Aimé Césaire, and Édouard Glissant. Finally, on the south-east side, towards the historical center of the city of Poitiers, streets have been named after the memories of the Second World War, including the French Résistance movement and commanders of the French Liberation Army.